Throughout 2012 we are sharing an illustration with you every week to help you to re-imagine the future that you choose. For the twenty-second week (it’s bank holiday Monday, so technically still week 22!) of 2012 we are sharing Lucy Shea’s Future. Lucy is the Chief Executive of Futerra, the sustainability communications agency. Shiny, happy and evenly distributed, an interesting idea whilst the UK are celebrating the Queen’s jubilee on this rainy weekend. 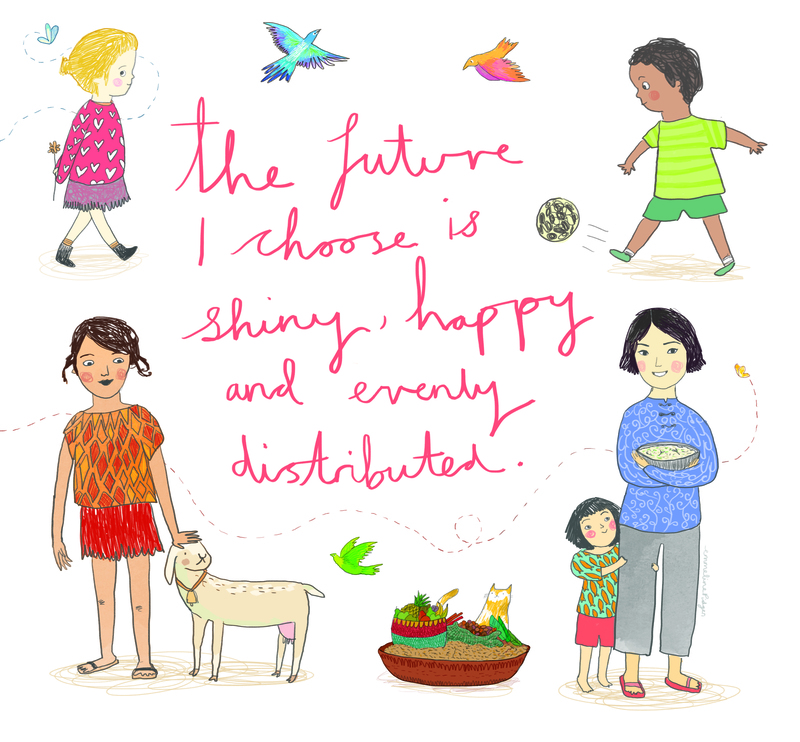 The Future I Choose is shiny, happy and evenly distributed. I chose this future because it was simple, hopeful and global. From an illustrative point of view it gave broad scope for showing a range of characters living with evenly distributed food, wealth, respect and happiness. The illustration reflects the brightness and simplicity of the ideal future Lucy put into words. You can see all 52 of The Futures Illustrations together in our gallery, here.